As a committed Rotarian and KidsOut Trustee, on 1st July 2016 Steve was appointed as to assist UK Rotary Clubs and members to ensure the National Rotary KidsOut Day continues to be a success and provides even more kids with a great day out whether it be on the traditional second Wednesday in June, first Tuesday in December or any other date! 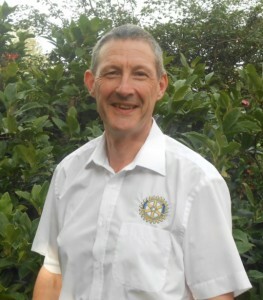 Steve Cartwright joined Rotary International in 2002, becoming District 1060 (Heart of England) Governor for 2012/2013, he is passionate about Rotary ideals and “putting something back into the community”, especially helping those most in need. With his undoubted enthusiasm and motivation, the Rotary motto “Service above Self” describes Steve’s total commitment. The National Rotary KidsOut Day at Drayton Manor Park provides a successful and super venue for everyone not just the kids, and Steve strives to ensure that this annual event goes from strength to strength. He is married to wife Gail, a member of British Mensa and has been an active football referee for over 30 years. As a member of St John Ambulance for many years, and was ultimately responsible for organising the First Aid and Medical Services for 13 years at the V Music Festival (Weston Park), being honoured as a ‘Serving Brother (Officer) of the Most Venerable Order of the Hospital of St John of Jerusalem’.